In this paper, an iterative substructuring method with Lagrange multipliers is proposed for discrete problems arising from approximation of elliptic problem in two dimensions on non-matching meshes. The problem is formulated using a mortar technique. 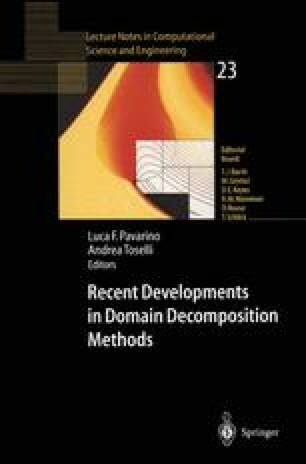 The algorithm belongs to the family of dual-primal FETI (Finite Element Tearing and Interconnecting) methods which has been analyzed recently for discretization on matching meshes. In this method the unknowns at the vertices of substructures are eliminated together with those of the interior nodal points of these substructures. It is proved that the preconditioner proposed is almost optimal; it is also well suited for parallel computations.